Is the container half empty or half full? That’s the classic question posed by a new sculpture in the reading garden at Winnipeg’s Millenium Library. It’s a giant beaker, like the sort you’d find in a science lab. It features fog, cascading water and at night a light show. Created by architect Bill Pechet of Vancouver the sculpture is made from 22,000 kilograms of steel. The Winnipeg Free Press article announcing the installation of the artwork is headlined Ambitious Nothingness and a Canadian Broadcasting Corporation report says Emptyful is causing raised eyebrows in Winnipeg because of its $575,000 price tag. My friend Rebekah, who was visiting from Minneapolis reaches out to touch the water raining down inside the bottom half of the emptyful container. A poster inside the library explains that the sculpture gets its name from the fact that the prairie surrounding Winnipeg is full of empty, boundless space where weather, light, the seasons and people come and go. The open spaces of the sculpture are meant to frame and highlight Winnipeg architecture. The shape of the container is supposed to suggest an experiment because Winnipeg is a constant experiment and a product of imagination and knowledge. Emptyful is an impressive piece of art but I do wonder why a Vancouver and not a Manitoba artist was asked to make it. Bill Pechet the sculpture’s designer admits to never having been in Winnipeg till he came here to create the sculpture. I wonder what someone from our province who had more intimate and longterm experience with the local landscape would have created. Emptyful is lit by a variety of colors at night and those colors will apparently change with the seasons. Emptyful is thought-provoking. Its size is certainly awe-inspiring and it makes an interesting addition to the city’s collection of public art. Last month former Winnipeg mayor Bill Norrie passed away at age 83. In an article in the Winnipeg Free Press the city’s present mayor Sam Katz praised Norrie for his phenomenal dedication to the city. Norrie served as the mayor for thirteen years. Although I didn’t know Bill Norrie personally I have never forgotten his commencement address in 2003 at the University of Manitoba. Our son was graduating and I made notes during Mr. Norrie’s speech because I wanted to remember his inspiring words. Bill Norrie was an honorary chancellor of the university. “An eye for eye makes everyone blind”. Chancellor Bill Norrie used that bit of wisdom from the great Hindu spiritual teacher Mahatma Ghandi during his address to the University of Manitoba graduates just before he presented their degrees. Mr. Norrie encouraged them to join the quest for justice and peace in our world. He noted with regret the many armed conflicts around the globe. The chancellor challenged the graduates to better the world by becoming active volunteers with cutting edge views. He encouraged them to take the kind of bold actions that bring about positive change. Norrie expressed his hope that the students would work to make Winnipeg and Manitoba welcoming places. He reminded them that at the university they had enjoyed friendships and mutually beneficial learning experiences with people of many different nationalities, cultures, life styles and religions. “The University of Manitoba student body is a snapshot of the world”, he said. “I think all here should be proud to know that this university had taken the lead in building bridges between diverse communities.” Mr. Norrie’s words were a call to the graduates to make the Manitoba communities in which they would live and work places where people of varied races, ethnic backgrounds and religious faiths respected one another’s differences and were enriched by them. Chancellor Norrie ended his remarks with a prayer written by Sir Francis Drake in 1577. Disturb us Lord, to dare more boldly. Where storms will show your mastery. What an exciting challenge to live a life where we risk much, to accomplish much, all the while trusting God to steer us towards the stars. You might also want to read…..
Today I took my friend and former Hong Kong teaching colleague Rebekah to visit Assiniboine Park. We stopped to look at this statue of an army officer and a bear cub. The cub was the inspiration for the literary character Winnie the Pooh. I thought everyone knew that Winnie the Pooh had a connection to Winnipeg but Rebekah, who is from Minneapolis wasn’t sure she did; so I decided a blog post about it might be a good idea. Harry Coleburn was born in England in 1887 and immigrated to Canada at age 18. After graduating as a veterinarian from a Ontario college he moved to Winnipeg. He joined the army during World War I and on his way to a training camp in Quebec he bought a bear cub. The train had made a stop at White River, Ontario and there Harry met a hunter who sold him a female bear cub for $20. The hunter had killed its mother. Harry named the bear Winnie after his adopted home city of Winnipeg. Harry was posted to England and took Winnie with him where she quickly became the mascot of Harry’s regiment, The Fort Garry Horse. Harry was the regiment’s veterinarian. When Harry was sent to France for three years he put Winnie in the London Zoo. When author A. A. Milne visited the London Zoo with his son Christopher, the young boy immediately fell in love with Winnie the bear cub and named his teddy bear after Winnie. That teddy bear would become the main character in a series of stories his father would write about Winnie the Pooh. After the war Major Harry Coleburn decided to leave Winnie in the London Zoo and went back to Winnipeg where he practiced veterinary medicine till just a couple of years prior to his death in 1947. A. A. Milne’s books about Winnie the Pooh became beloved pieces of children’s literature read around the world. Later Walt Disney turned the stories into a movie and television series. 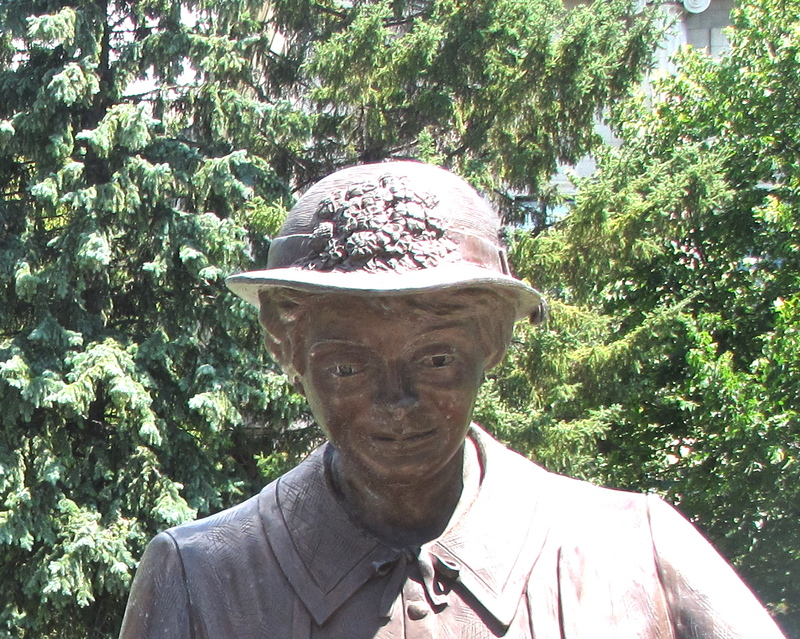 This statue just outside the Children’s Nature Playground at Assiniboine Park recognizes the connection between Winnipeg and the literary character Winnie the Pooh. A plaque nearby explains the story of Harry Coleburn. His impetuous decision to purchase a bear cub and name it after Winnipeg had consequences that reached far beyond anything he might have imagined. Just two blocks from our home is a massive bronze sculpture called Seal River Crossing. It stands in a plaza between the Fairmont Hotel and the Richardson Building. I like to go and look at it at different times of day and from different angles. It depicts a herd of caribou fording the Seal River. The Seal River is one of the four major rivers in northern Manitoba. It is over 150 miles long and runs into Hudson Bay. The river which is too dangerous to use as a transportation route is traveled annually by only a small number of very skilled kayakers looking for a challenging adventure. Yet herds of caribou cross this unpredictable river regularly as they make their way across the northern tundra. Looking at the sculpture from the rear the water looks fairly deep. Crossing the river is no easy venture for the caribou. It can be fatal. I took this picture early one morning and liked the way a younger, smaller caribou was resting it’s head on the back of the larger caribou as they navigated the formidable river. The more experienced mature caribou was bearing some of the younger one’s weight as well as providing direction and stability. There are eleven caribou in the sculpture and the three lead animals have just arrived on the far side of the river and are climbing the embankment to make their way out of the water onto dry land. Seal River Crossing was created by artist Peter Sawatsky, who grew up in the Mennonite village of Sommerfeld in southern Manitoba. According to the Loch Gallery website, Peter who was born in 1951, studied at Red River Community College and began his art career doing landscape and wildlife paintings. He gained international recognition as a bird carver before deciding to set up a foundry and begin working in bronze. Richardson & Sons Ltd. commissioned this work in 2007 to celebrate their 150th year of business in Manitoba. Peter Sawatsky has done a masterful job of depicting the grace and beauty of the caribou’s antlers. Interestingly both male and female caribou have antlers. Caribou biologist Doug Urquart writes that males shed their antlers each November, while females carry their antlers all winter, shedding them only after having given birth in spring. Caribou antlers can weigh up to 20 pounds and have a span of up to 112 centimeters. One morning as I was walking by the sculpture I noticed a little boy had crawled up onto it. I had never thought of Crossing Seal River as an interactive piece of art before, but this small fellow was clearly in his element “riding the reindeer” as his Mom watched and took pictures of him. The Seal River is very remote and isolated. Accessing it is expensive and must be done first by plane and then by a long hiking journey. Consequently very few people have ever had the opportunity to see the caribou crossing Seal River. Artist Peter Sawatsky is one of the fortunate few to have witnessed the sight. Thanks to his remarkable talent and dedication those of us who live in Winnipeg can view the heart-stopping grandeur of the caribou crossing Seal River as often as we like. I walk or drive across the Provencher Bridge almost everyday. What a stunning structure! Built in 2003 it is designed for both cars and pedestrians. I like to look way up at the top of the bridge where the side spar wires join together. I get deliciously dizzy, seeing all those pristine white cables create a perfectly spaced musical staff pattern in the blue sky. The bridge spans the Red River and is the third one built in the same place. The current bridge was designed by Etienne Gaboury and Colin Stewart. I admire their creativity and often wonder how they dreamed up the plans for such an unusual structure. The pedestrian part of the bridge is called Esplanade Riel. It is named after the Metis leader Louis Riel, the founder of the province of Manitoba. There is aboriginal art on the bridge. It is just a short distance from The Forks where the Red and Assiniboine rivers intersect. Canada’s First Nations people came to The Forks for over 6000 years to meet and trade with one another. Symbols for flying birds, the sun, flowers, fish, feathers, hills and water fowl are etched into the stone as well as some ribbons or ropes that are reminiscent of the bridge’s cables. On this section of the girders the art isn’t quite the same. A sun stylized in a unique way is the focal piece again, but this time there are butterflies and moths instead of birds and some crawling creatures that look like grasshoppers and beetles. Once again there are the winding pieces that resemble roads or paths or perhaps the back of a snake. An engraving explains that the artistic images on the bridge describe the creation of the world. The plaque tells the story in detail beginning with the words……….In the beginning all was stark and barren. Then on the dawn of the first day the earth came alive and offered its magnificent beauty in an endless cycle of seasons. There is a Salisbury House Restaurant on the bridge. Salisbury House is a burger and chips kind of chain owned in part by the famous Winnipeg singer Burton Cummings of Guess Who fame. When I walk across the bridge and view the sky, the tree line and the historic St. Boniface Basilica facade through the taut cables; I am struck by what I beautiful city I am living in, one that can rival the many famous cities of the world I have visited in the last six years. “You are not persons” the Supreme Court of Canada told these five women in 1927 when they petitioned the court to determine whether as ‘persons’ they were eligible for appointment to Canada’s Senate. The court said they weren’t really people and therefore ineligible for Senate appointment. The five women didn’t give up their fight and appealed to the British Privy Judicial Council who ruled they were indeed people. 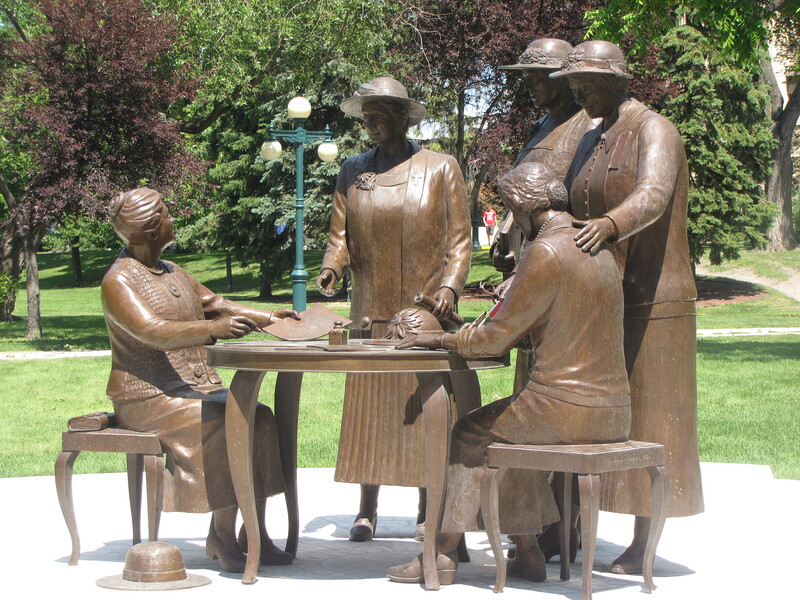 They are known as Canada’s Famous Five for their important contribution to women’s rights in Canada. 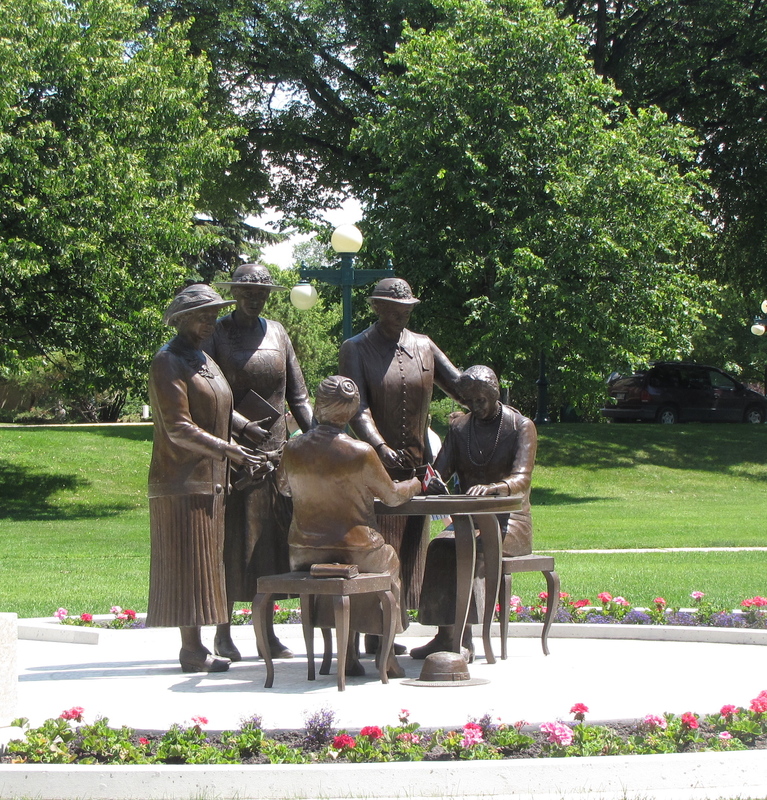 Walking across the grounds of the Manitoba Legislature this summer I stopped to photograph this statue of the Famous Five created by Helen Granger Young and unveiled in June of 2010. The five women are………. Henrietta Muir Edwards who founded the Victorian Order of Nurses and set up a house in Montreal for single working women, a forerunner of the YWCA. She was married to a doctor and had three children. Emily Murphy was a bestselling author married to an Anglican minister and the mother of four daughters. She was the first female appointed as a magistrate in the British Empire. She was instrumental in having the Dower Act passed which ensured that upon the death of a man his widow was entitled to at least a third of his estate. 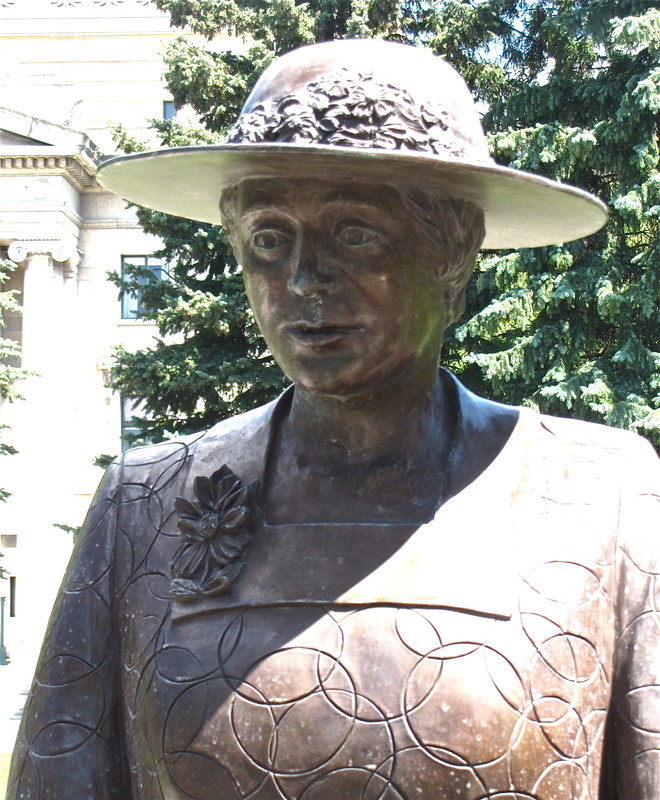 Irene Parlby sponsored the Minimum Wage Act for Women in 1925 and as the President of the United Farm Women of Alberta did much to improve health care for rural women and children. She was the second female cabinet minister in Canada. 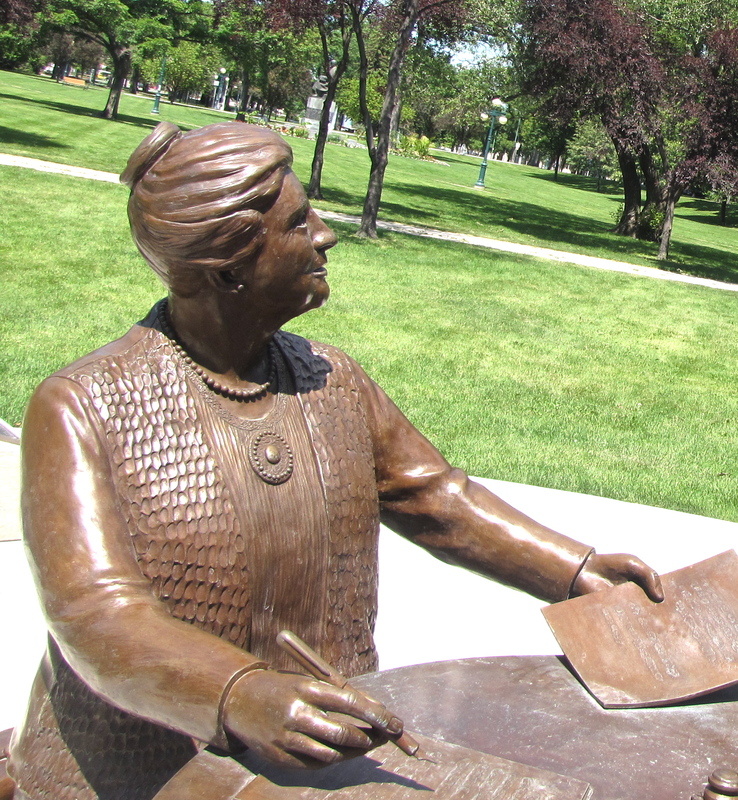 Married to a farmer and the mother of one son, Irene was the first woman given an honorary degree by the University of Alberta. 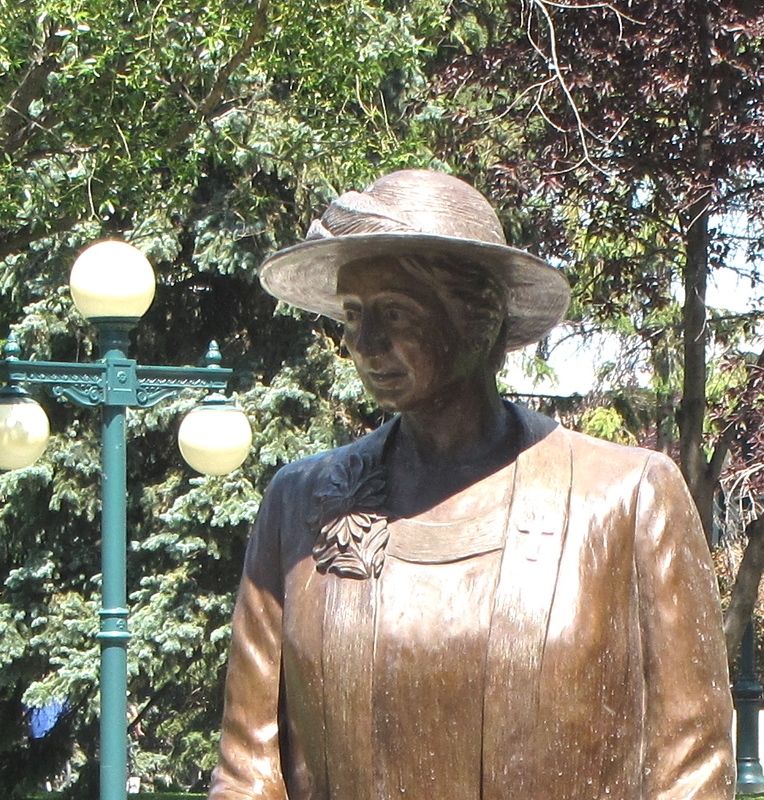 Louise McKinney was an excellent debater and a member of the Alberta Legislature where she was instrumental in passing legislation to support people with disabilities, immigrants, widowed and single women. A teacher, she and her husband traveled together. Nellie McClung is perhaps the most famous of the Famous Five because she played a key role in women getting the right to vote and run for public office in Manitoba in 1916. 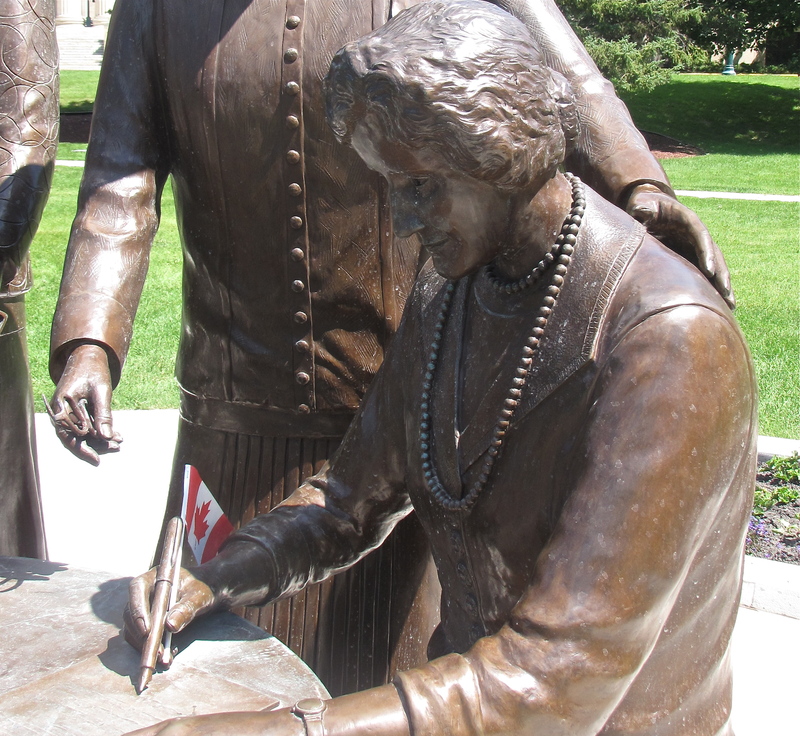 Manitoba was the first province to give women the vote in Canada. She was married to a pharmacist,had five children and was a best-selling novelist. 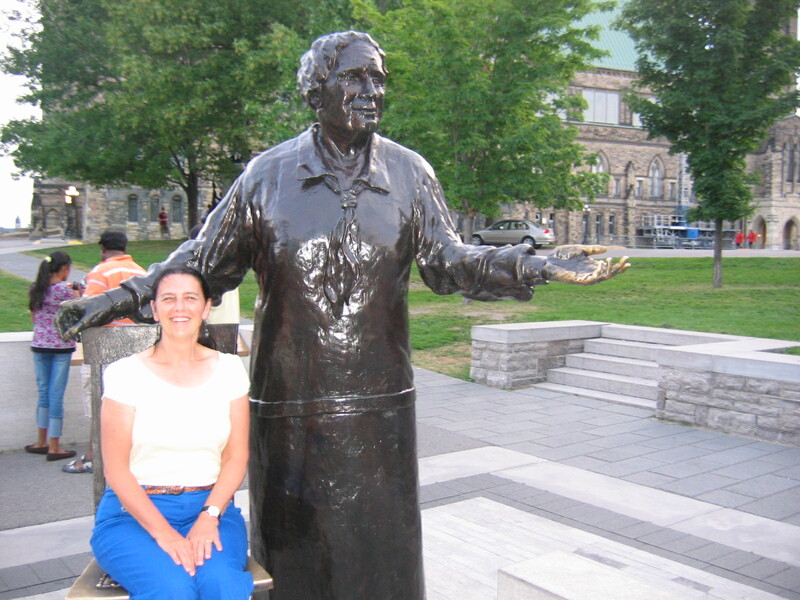 There are also statues of the Famous Five in Ottawa on Parliament Hill and when I visited there several years ago I posed with Emily Murphy. 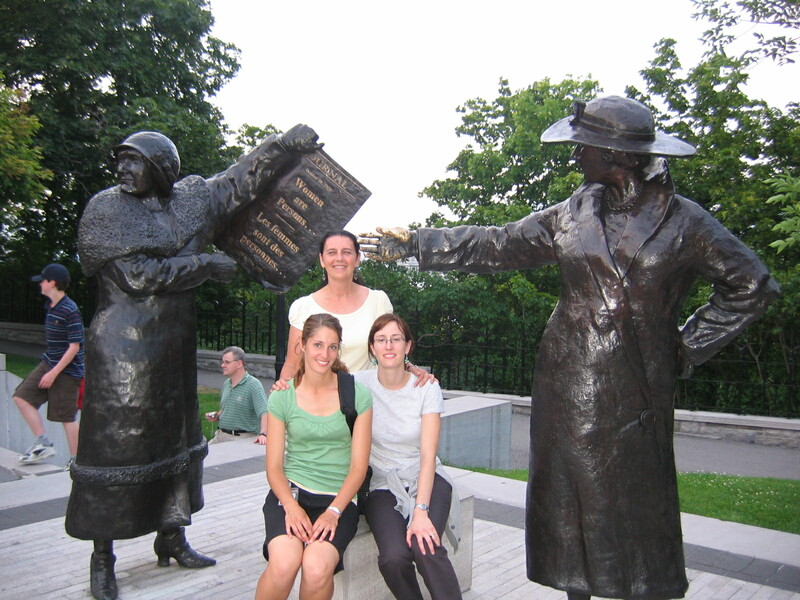 Here my daughter-in-law and her sister and I are between Irene Parlby and Nellie McClung who is holding up the newspaper with the headline Women are Persons. My husband and daughter-in-law sip tea with Henrietta Muir and Louise McKinney. 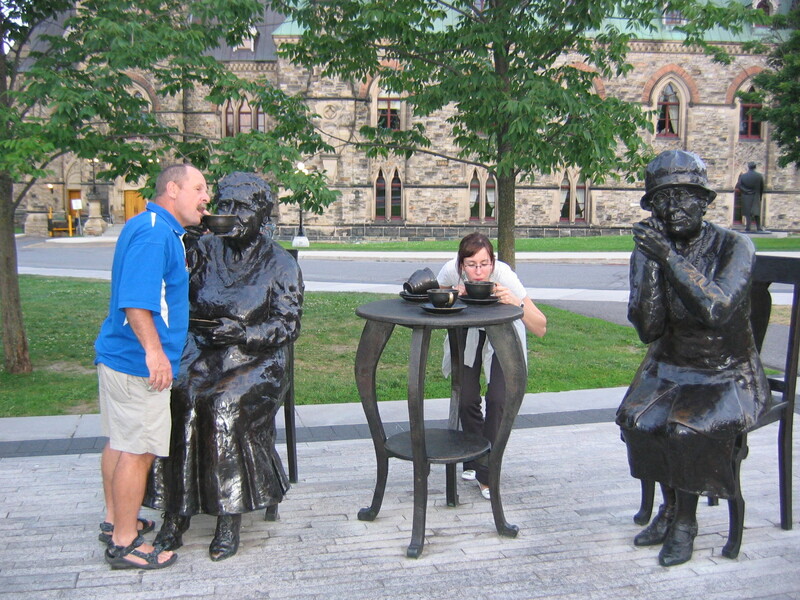 I’m glad to know there are statues of the Famous Five in Winnipeg and I don’t have to go all the way to Ottawa to see them. Around the sculptures in Winnipeg is an enclosing circle of brick engraved with a quote from Nellie McClung. I want to leave something behind when I go; some small legacy of truth, some word that will shine in a dark place. If you enjoyed this post you might also like these posts about other statues of famous people in Winnipeg…………..
Inuit art is a contemporary and not a traditional art form that was created almost purely for commercial purposes. If I had to state the most memorable and surprising thing I’ve learned about Inuit art that’s it! The Winnipeg Art Gallery where I’ve been working as a tour guide for the last couple months has the largest collection of Inuit Art in the world. When I started giving tours I knew nothing about Inuit art so I decided I needed to educate myself. I’ve been doing some reading and research and here are ten interesting things I’ve learned so far. 1. The birth of Inuit Art was almost an accident. In 1948 artist James Houston visited Arctic Quebec. He bought some small Inuit stone and ivory carvings home. The Canadian Handicrafts Guild sent him back up north in 1949 to buy hundreds more for their annual sale. 90% sold in three days. Between 1951 and 1952 Houston toured the Arctic telling the Inuit what they should make and what materials to use. Soon sales of Inuit art had grown to such a large volume the Hudsons’ Bay Company took over managing the business. And thus the Inuit art industry was born. 2. Some people think Inuit art is the result of a giant government sponsored welfare project. The Canadian government promoted Inuit art and adopted it as a symbol of the north. They wanted it to thrive because they saw it as an answer to the problem of unemployment in Canada’s north. Up to 25% of people in some communities are involved in creating art. 3. There really wasn’t very much Inuit art being made before the early 1950’s. Not many artistic artifacts dating before 1700 have been found. Some animal and human figures, masks, ritual objects used by shamans, pendants and lots of small models of flying or floating polar bears have been preserved. In the late 1700’s more objects were made at the request of traders, missionaries and whalers who began to visit Inuit communities. They wanted models of hunting scenes, cribbage boards, and Christian images. Some explorers asked the Inuit to make maps with paper and ink and to draw wildlife scenes for them. They began to add more details to their carvings and make them bigger to please their customers. 4. Inuit sculptures are not only made from one kind of stone. A whole variety of different kinds of stones are used as well as lots of other material like walrus ivory, antlers, driftwood and whale bone. Many different tools are used to create sculptures including axes, hatchets, chisels, mallets, rotary grinders, files, rasps, emory clothes and sandpaper. 5. There are predominant themes in Inuit art. Animals play a vital role in Inuit life and art. Older Inuit spent years watching, stalking and killing animals, so they know them well. Everyday life is another important theme–people preparing food, hunting, playing games and sewing. The family is a recurring theme particularly mothers and their children. Younger artists often carve figures that have to do with ancient shamanism and the supernatural. Older artist will not carve these kinds of figures because they believe them to be evil. For nearly two hundred years the Inuit have been predominantly Christian, converted by zealous missionaries. Some have explored Christian themes in their art. Inuit legends and myths are also frequent themes. 6. Art from six key areas of the north can be very different. This is because each region has different materials available to use to create art pieces. Also each region has had different outside influences. The personal tastes of the advisors and entrepreneurs who work with the Inuit artists and buy their work has a big influence on the kind of art they do. Influential artists in certain communities have developed their own personal styles and that has influenced other artists in their community. 7. Although 80% of Inuit art is sculpture there are other important art forms as well. Drawings and paintings done with colored pencils, acrylic paint and water-color recall the glory days of the hunt and traditional camp life. Textile arts are mostly the domain of Inuit women who create tapestries that are often very colorful and large. Printmaking is also a staple of Inuit art. I have explained how that came to the north in my post The Globalization of Art From Japan to Cape Dorset. 8. It is hard to categorize Inuit art. Much of it was made for commercial purposes to be sold as souvenirs. Various labels have been suggested for Inuit art. Is it fine art, folk art, tourist art, ethnic art or Canadian art? Fine art galleries like the Winnipeg Art Gallery and the Canadian Museum of Civilization began to collect Inuit art already in the 1960’s, but other national art establishments like the Art Gallery of Ontario and the National Gallery only began to embrace it in the 1980’s. All four of these galleries now have separate Inuit art curators. 9. Inuit art does preserve culture, language, stories and the Inuit identity. While Inuit art provides a record of traditional Inuit life and has become a vehicle for cultural preservation this was not the purpose for which much of it was created. It was art that was made for export and not for teaching Inuit children about their heritage. 10. Many modern Inuit artists want their work to show the reality of life for the Inuit today. Will they choose the path of innovation or tradition? Younger artists see their work more as a means of self-expression than a way to preserve Inuit traditions. They tend to be more experimental. In the past Inuit art was never abstract. This is changing. I am looking forward to learning much more about Inuit art as I continue to read and research and explore the large collection of Inuit art at the Winnipeg Art Gallery. Much of the information in this post comes from the book Inuit Art : An Introduction by Ingo Hessel. The art works pictured are all from the Winnipeg Art Gallery site and are pieces in the Winnipeg Art Gallery collection. They’re filming a movie in our building! When I got home from the gym yesterday morning I could barely get in the front door of our condo. The Ashdown Warehouse was serving as a set for a Canadian Broadcasting Corporation movie about political leader Jack Layton . I asked some of the crew about the film and they told me the foyer, front steps and two suites in our condo were being used in the movie. They were very apologetic about any inconvenience caused to the tenants and were extremely polite and courteous. Later in the day when I left the condo to buy groceries I saw tons of equipment at the end of our hallway. Turns out the two condos where interior scenes were being shot were on our floor. A film crew member I rode down with in the elevator told me one condo was being used for the livingroom of Jack Layton and his wife Olivia Chow’s home, and another condo was where the bedroom scenes would be shot. When I got back from the grocery store, I rode up in the elevator with a filming assistant carrying Chinese take-out food in a bag. Turns out it was being used in the next scene they were filming. It took most of the day for the them to do the shooting. When I was taking the trash out in the late afternoon, Sook-Yin-Lee the woman who plays Olivia Chow and an older Asian woman who I assume must be playing Olivia’s mother, came out of an apartment near ours with a make-up artist following behind with bags full of cosmetics. I couldn’t believe how many people and trucks and pieces of equipment it took to film a few scenes from a movie. A whole block of the street adjacent to our front entry was closed off for movie vehicles and personnel. 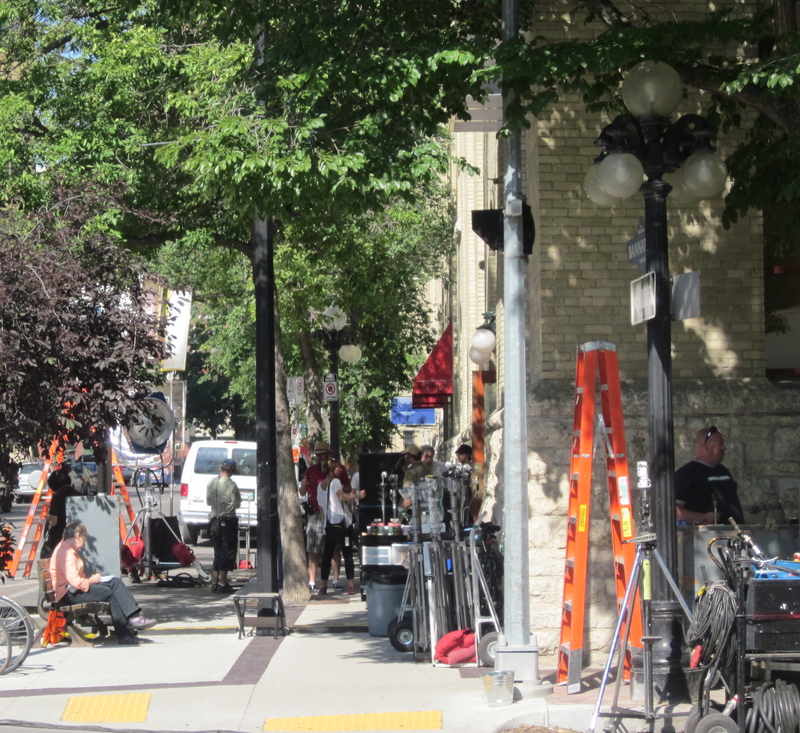 One of the crew told me they were moving on to Selkirk, Manitoba to continue filming. 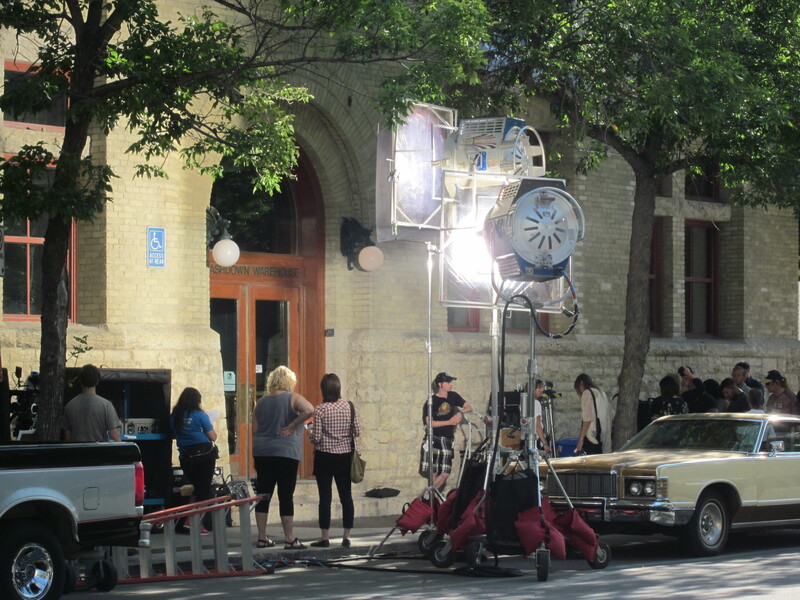 I know that Winnipeg has become a popular spot for making movies, especially in the Exchange District where so many historical buildings have been preserved. I’ve seen film crews in action before, but had never noticed any on our street. It was pretty exciting! Although we had to use the back doors for a while during the day, the inconvenience was worth it just knowing the place where you live was being used as a movie set. I can hardly wait to see the film when it comes out!